It always happens when you are not home. “Did I switch off the television? Did I actually close the front door?” Small elements of doubt start creeping into your mind. Sounds familiar? Well, home automation or the smart home can help you stop worrying with a quick glance at your phone or tablet, since all devices and appliances are connected with each other and most of all, with you. The movie Her gives a small impression of what a smart home actually means, namely a place where devices and technology are very subtle or in other words are present in the background. All of the electronic devices and automation systems are connected to create one network that provides the owners of the house security, entertainment, etc. Furthermore, any electricity-consuming device or appliance such as a thermostat, TV, laptop and speaker can be added to one network – your home network – and, consequently, at your command – whether given by voice, on the tablet or on a remote control – the home always reacts. Smart homes and connected devices work in a similar way as the electronics we use daily. The moment we are connected to a computer, we can download, access, share and store digital files in one single location. The hard drive or cloud serves as the network hub, on which it is not difficult to access, store and share files from all devices that can be enabled to share information. No single app nor a control panel is needed to control everything: technologies in a smart home are programmed to work together in order to control all systems via tablet or smartphone. Every single thing in the house occurs automatically because the house itself understands everything without you indicating what you want. For example, the smart home can let you know what is happening in your house when you are at work or on vacation. Other cool smart home tricks are unlocking your door when you get close, warming the bedroom before you get up or creating mood lighting for every occasion etc. Smart houses will certainly be a hit among the next generation since it can make their lives easier and, above all, more convenient. Young people today are part of the age of impatience: they want it all and they want it now – and with only one click. What is more, they have even become quite lazy, given the fact that they do not want to lose too much time or energy. That is why smart houses will be right up their street. The primary reason for this proved to be comfort: admit it, who would not love being able to control not only lighting, but also temperature and entertainment right from their couch? 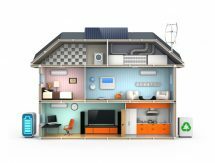 Other elements that were taken into account by young people in opting for a smart home were the opportunity to have a safer home and to live more energy-efficiently. Up until today, automating one’s home used to be a privilege for those with a rather big budget. Today however, home automation is no longer an option that should be ruled out by young people who want to build a house. Along with qualities such as being intuitive and contributing to a better quality of life, green homes are gradually becoming an even bigger part of smart home technology since biometrics, wireless and wearable technology are becoming more relevant to young people every day. Having a smart home can also be hugely beneficial to your electricity or heating bills, given that it results in some serious energy saving. Devices and appliances go into sleep mode and only wake up when certain commands are given, since these are set up at a reduced level of functionality. Rooms for example are only heated or cooled when someone is actually present in them and lights are automatically switched off in empty rooms. Also, some devices can command power hogs to use less, based on their ability to track each appliance’s energy consumption. Next to being energy-efficient, smart homes provide other benefits to the owners. Broken remotes for example will no longer have to be wrapped in duct tape and rubber bands. Furthermore, pointing and aiming a remote control at a small IR sensor to change channels will be something of the past since remote controls will be able to transmit through walls and furniture. When referring to all those connected products and devices, we stopped using the Internet of Things and introduced the term smart homes. A distinction has to be made between a connected home and a smart home: the connected products that already exist do not communicate optimally, but in order for our homes to be smart they have to talk and interact with each other smoothly. Up until today, a completely connected home used to be an unreachable dream for consumers, because of technical limitations. However, thanks to the development of wireless technology and mass-deployed broadband Internet connections, consumers today can enjoy the benefits of smart devices in their home. As mentioned before, a connected thermostat for example is based on the movements of the residents of a house these days and, as a consequence, makes sure the house is well warmed up when they get home. However, when the residents unexpectedly get home earlier, a house can be quite chilly. That is where the smart home comes in: thanks to the connection with your car, your house knows you’re coming home earlier. A connected house cannot give you the same results as human interventions are required. These benefits over the connected home and, in addition to this, the degree of autonomy and intelligence will get the next generation excited about the smart home, as it could be seen as the equivalent of living in a serviced hotel. Grocery shopping, laundry, optimizing the heating system…, all the stuff you never want to do will all be done for you and it will give you much more spare time. In order for this to happen, we need a shift from the gadget-oriented connected home to a smart home. Companies like Nest and Jawbone state that a combination of the two is required in the future. For Nest, technology is rather present in the background, where everything works without you realising it: in case of a fire, for example, a smoke alarm will automatically switch off the boiler and e-mail you a notification. Jawbone on the other hand is convinced that wearables will be the main factor in the smart home experience, because these will make us feel part of a smart home. Thanks to sensors, the thermostat knows you have a better night’s sleep at a certain temperature and your car can play relaxing music when you have had a bad day. Smart homes are becoming a growing trend, going from very basic security systems where you have to press a button to house owners being able to control their house from everywhere, worldwide. Decor-friendly gadgets are one of the technology trends that will certainly make wave in the coming years. Door locks, thermostats and so on will be sleek and aesthetically pleasing. Home automation technology in other words will blend in with an already existing decor. The look of a smart home will be especially important to young people. Another popular trend will be smart door locks. Carrying grocery bags and a child do not really go together with efficiently unlocking a front door. Therefore, automated door locks will automatically open when detecting you as an authorized person. Young people these days like the feeling of being in control of everything. That is why advanced security systems will also be a popular gadget among youngsters, as they will never miss out on anything as a result of access to real-time security systems. As mentioned before, energy consumption and saving money are a few very important factors for young people. Programmable and zone-based thermostats tackle either of these concerns: the heat can be turned down or off from anywhere and sensors are used to warm up only occupied rooms. Great article! We have also found that consumers are turning to smart home tech to meet their own security needs. People use it to watch their kids or pets while away.